Few scholars have so shaped the contemporary debate on the relation of early Christianity to early Judaism as E. P. Sanders, and no one has produced a clearer or more distinctive vision of that relationship as it was expressed in the figures of Jesus of Nazareth and Paul the apostle. 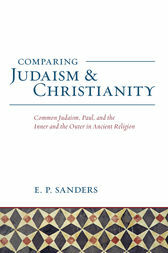 Gathered for the first time within one cover, here Sanders presents formative essays that show the structure of his approach and the insights it produces into Paul’s relationship to Judaism and the Jewish law. Sanders addresses matters of definition (“common Judaism,” “covenantal nomism”), diversity (the Judaism of the Dead Sea Scrolls and the Diaspora), and key exegetical and historical questions relative to Jesus, Paul, and Christian origins in relationship to early Judaism. These essays show a leading scholar at his most erudite as he carries forward and elaborates many of the insights that have become touchstones in New Testament interpretation. E. P. Sanders was professor of religion successively at McMaster, Oxford, and Duke Universities and is a fellow of the British Academy and of the American Academy of Arts and Sciences. He has written numerous landmark books including, from Fortress Press, national award winning Paul and Palestinian Judaism: A Comparison of Patterns of Religion (1977), Jesus and Judaism (1985), and Paul: The Apostle’s Life, Letters, and Thought (2015).